Product prices and availability are accurate as of 2019-04-20 03:23:14 UTC and are subject to change. Any price and availability information displayed on http://www.amazon.com/ at the time of purchase will apply to the purchase of this product. 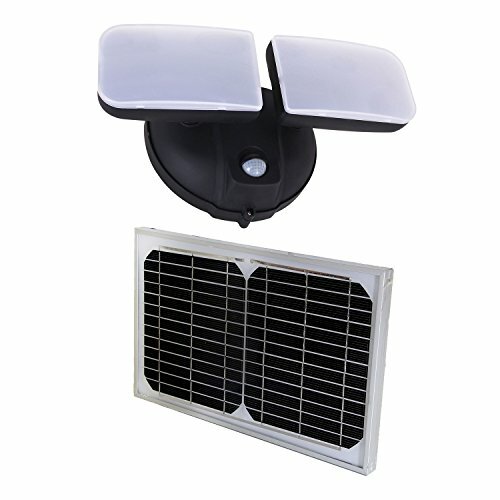 EE828WDC, eLEDing, Green Energy, Microgrid, Dual Head Solar Light offers outstanding quality and reliability. Its distinctive wide range applications and engineered SMART lighting features provide lighting enhancements that are significantly beyond the level of current solar lighting technology. This newest generation light is equipped with two ultra-bright LED illuminators, unlike traditional old-dated LED illuminators, and they provide a brightness level equivalent of up to 50x50 W+ Halogen lamp. It operates under a software based Intelligent Power Management (IPM) system. It can be used for most lighting installations, replacement of AC lights, or backup lighting during AC power outages. It offers true Dusk-to-Dawn lighting with innovative SMART Dim-lighting profiles. It has built-in auto compensation for all weather conditions and variations of geographic locations. This light is embedded with an exclusive pure digital hybrid lighting engine. Max-brightness or dimming of Moonlight lighting is controlled with user adjustable dials. In SMART AUTO profile, it acts as a traditional motion security sensing light. It also can replace the traditional IR illuminator as a white light illuminator for video surveillance systems without AC power limitation and in darkness conditions it provides enhanced full color image vision. This is a highly efficient SMART solar light designed for residential, commercial, industrial, and recreational lighting. THREE OPTIONAL MODES: Choose the perfect mode according to your diverse needs. illuminating brightness high level Mode suits for the front door, back door, outdoor patio, deck area backyard and etc. 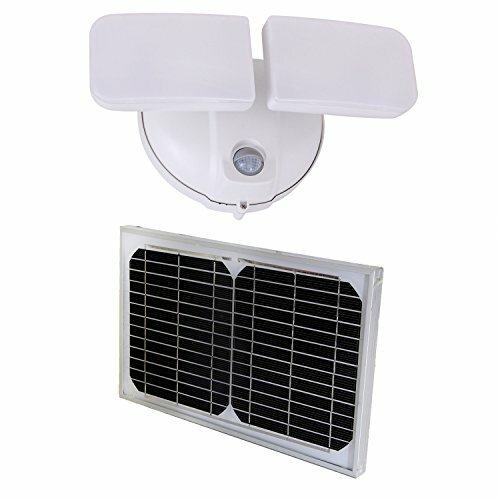 Reduced Light Mode suits for balcony railing, side and back yard, entryway and etc; Motion Detected Mode suits for garage, driveway, path, fence and etc. 80 Hours Continuous Illumination ?Exclusive Intelligent Power Management (IPM) for lithium based battery power management enables this light to provide continuous illumination for up to 80 hours when operating in the SMART profiles. It is capable of true dusk-to-dawn lighting even during the winter season. More Safely and Lower Consumption ?Dual Head 10W LED(5W each), 28WH Li-Poly battery, Tempered glass solar panel ?with 10'cable?and PC light fixture.Ingress protection IP65.Comparing with traditional halogen lamps, our LED flood lights save up to 70% electricity cost. Ultra-bright with two angle adjustable powerful 5-Watt high efficiency LED illuminators of light head providing daylight white illumination and wide area lighting coverage with adjustable user controls that enable tailoring brightness to your personal illumination preference FREE WARRANTY: Our fan-favorite 12-month warranty and friendly customer service. So if you have any problem, Please feel free to contact me.